In this two-day Rotterdam itinerary, I cover my favourite spots and must-see attractions for first-time visitors to the city. 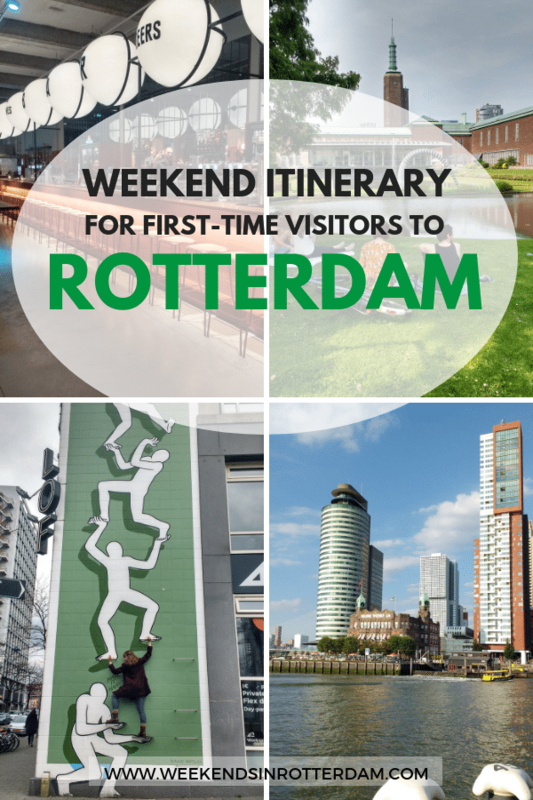 It’s a packed weekend route, as there’s so much to see, do and eat in Rotterdam. We’ll only be staying in the central parts of Rotterdam for this weekend itinerary – be sure to also explore what lies beyond the city centre if you’re staying for longer! And if you’re interested in a specific aspect of Rotterdam culture, history, art or lifestyle, check out our themed routes. If the weather allows it (and if you haven’t had too many potions at the Dr.), you can then take a short walk from the bar to the river Maas, to see the famous Erasmus Bridge (Erasmusbrug) and surrounding buildings lit up in the night. Start your morning in Rotterdam with a very locally sourced breakfast at Op Het Dak, a café-restaurant located on the DakAkker rooftop farm and urban garden. There’s breakfast platters, homemade cakes and yogurt bowls, accompanied by a nice view over the city centre. Leave the café via the Luchtsingel, and enjoy a quick stroll on this bright yellow elevated wooden footpath, which makes a great background for photos. If you didn’t arrive in Rotterdam via Centraal Station, plan a quick detour now to check out this architectural icon. Then, set out towards the Laurenskwartier: walk around the back of the impressive Stadhuis (city hall), past the turquoise-tiled police station and super-modern Timmerhuis. In the Laurenskwartier, you’ll find more Rotterdam icons, including the Kubuswoningen (Cube houses), Laurenskerk church and Markthal food hall, as well as a huge market on the Binnenrotte. First, have a quick look around the medieval Laurenskerk. Every Saturday lunchtime between April and October, you can take a tour of the church’s bell tower, to learn about its history and enjoy beautiful views over Rotterdam. Then, head to the forest of yellow Cube houses, all tilted at a 45-degree angle. You can visit one of the houses for just a few euros, to find out what living sideways looks like. Beyond the Cube houses, you can also explore the Oude Haven (Old Port) and Witte Huis (White House), Europe’s first high-rise building. Stop for lunch at the Markthal, while admiring its grand architecture and colourful ceiling. Walk around the stands and pick up a few bites here and there as you go: there’s Dutch-style croquettes in a bun, Spanish pinchos, Turkish gozleme, sweet poffertjes, and, of course, plenty of cheese and stroopwaffles. You can also sit up above the stand of your chosen food vendor, to enjoy a more relaxed sit-down lunch with a lovely outlook across the Markthal and beyond. Just a few minutes’ walk from the Markthal, you’ll find the Maritime Museum. This interactive museum tells the story of Rotterdam’s seafaring history, as well as the maritime world’s impact on our lives today. There’s plenty of activities for children and adults to enjoy, including the Offshore Experience, where you get tasked with the difficult jobs of employees working at sea. You can also come aboard historic boats in the Maritime Museum Harbour. Now you’ve learned all about the sea, it’s time to get on the water yourself. Make your way to the Leuvehaven/Centrum water taxi stop, which is located right outside the Maritime Museum, and call a water taxi (you can also book in advance). The taxi will take you on a thrilling river ride, under the Erasmus Bridge and whizzing past the city skyline. Our next stop is just a short way away at Wilhelminapier/Hotel New York for Kop van Zuid. If you want to enjoy a longer ride on the water, you can also book a water taxi boat trip, which lets you determine the route and length of the trip yourself. Or, if you prefer a more docile exploration of Rotterdam’s waterways, you can book a Spido harbour tour, which sets off at the foot of the Erasmus Bridge. Spend your evening exploring the history and culinary delights that lie south of the river Maas. You can make it to Kop van Zuid with a water taxi, or simply by walking over the Erasmus Bridge. Here, you’ll find Hotel New York, the former head office of the Holland-America line; the imposing ‘vertical city’ De Rotterdam; and one of Rotterdam’s latest foodie additions, the Foodhallen. You can sit back with a pre-dinner drink and snack in any of those locations. Alternatively, walk over the pedestrian bridge to trendy and edgy Katendrecht, and enjoy a small aperitif at the Fenix Food Factory: I recommend the cheese platter and apple cider. Then, head a little further into Katendrecht to find a series of great little restaurants along the Deliplein. Try Kwiezien for delicious French cooking in an intimate setting, Vislokaal Kaap for super fresh fish, or Deli Bird for authentic and unpretentious Thai food. If you have your eye on a specific restaurant, be sure to book in advance, as they can get very busy. If you still have some energy left after all this walking, a great place to spend your Saturday night is Witte de Withstraat. This lively street lined with bars comes alive at night with merry crowds of partygoers and funseekers. Hop from gin bars and chilled pubs, to dancing bars and cocktail lounges, until you find the best fit for your taste and mood. Begin your day with a lazy breakfast at Yoghurt Barn, located a short walk from the Museumkwartier. As its name suggests, this very Instagrammable eatery serves yogurt bowls, yogurt dips, yogurt on toast and more, with deliciously fresh and organic toppings. Spend the rest of your morning exploring Rotterdam’s charming Museumpark and the museums that surround it. The Kunsthal always puts on fun, fascinating and at times freaky art exhibitions, and the Museum Boijmans Van Beuningen displays an amazing collection of art. 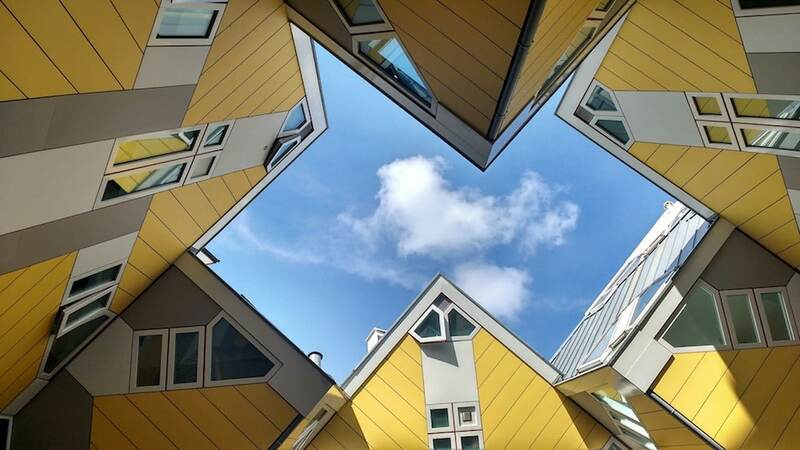 If you’re not so much into art, there’s also the Natural History Museum, architecture and design at Het Nieuwe Instituut, and several more smaller museums in and around the area. Note that most museums only open from 11am on Sundays. When you’ve had your fill of culture, walk over to Witte de Withstraat and explore this area by day. There’s plenty of cafés and lunch spots to choose from in and around the main street. You can then also take some time out to shop in the street’s quirky boutiques, explore the art galleries, and take a photo with the interactive street art. And if you want to continue shopping in Rotterdam, the nearby Lijnbaan and Koopgoot will keep you busy well into the afternoon. If you prefer a more laid-back Sunday afternoon in Rotterdam, plan a visit to Het Park, which is a 15-minute walk or short tram ride from Witte de Withstraat. Take some time out to sunbathe, relax or explore the hidden corners of this pretty city-centre park. You can also rise up to the top of the Euromast, located on the edge of the park, for panoramic views of the city. End your weekend in Rotterdam right next to Het Park, in the Scheepvaartkwartier. This historic district is set around the Veerhaven inner harbour, which is filled with traditional sailing boats and surrounded by restaurants. Taste a little of everything with a rijsttafel (rice table) at Indonesian restaurant Dewi Sri. Enjoy top-quality fish dishes at seafood restaurant Zeezout. Tuck into wood-fired pizza at bustling La Pizza. Or choose another of the numerous restaurant options in the area, to reflect on your busy weekend in Rotterdam over a delicious dinner. Find all the sights on this map! Have you visited Rotterdam before? Share your favourite spots in the comments below!